It’s so weird but I keep saying that I’m going to miss him. I’ve been talking about him like I knew him beyond what I’ve seen of him in his movies and I know it’s super weird but I can’t stop because he was in so much of the things I watched. He was pretty much in everything. He was the scariest dude on screen more often than not and his Dracula was the best I’ve ever seen. 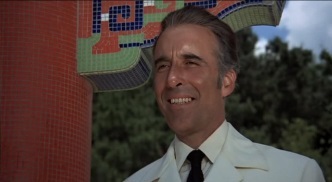 I mean… it was just last week that I was watching him as Scaramanga in The Man With The Golden Gun. When I saw the first tweets about it from Tor yesterday morning and then clicked through to the webpage, I was crushed. I’m still crushed. But I keep reminding myself Christopher Lee lived a long life. More than that, he lived an amazing life that was rich and fill of adventure in its entirety. He’s what action heroes could’ve and probably should’ve been like. Geez. I can’t think about him without wanting to marvel at the life he lived. He’s a history major’s dream figure because he did so much, lived so much, was so much. The world will truly be a truly poorer place without him. This entry was posted in Movies and tagged Christopher Lee. Bookmark the permalink.